Could Dunmore East's Development Be Key to Ireland's Cruising Success? #irishcruising – Henry Ford famously said that if he'd started out by asking people what they wanted, they'd have demanded a faster horse. Quite. But if you don't have the lightbulb moment of a Fordian concept so utterly brilliant that it creates its own market, then a bit of humdrum research to find out what the market wants will seldom go amiss. Encouraging cruising visitors to sail to our coasts provides a good example. Irish sailing has such a long history of its own that it takes an effort to imagine what sailing visitors to our shores are hoping for. But for cruising visitors in particular, if we have to narrow it down to just one aspiration, we'd probably find that they love to go home with a photo of themselves sailing along with the Fastnet Rock in the background. Better still, a photo of their boat sailing past the Fastnet on a brisk but sunny day, with themselves at the helm – now that really will hit the spot. And then a video of them celebrating afterwards at some nearby and hospitable port over a convivial seafood feast in a characterful inn, accompanied by traditional music - that will do nicely too. But it's likely many Irish sailors would no more bother to get themselves that Fastnet photo than New Yorkers would go out of their way to be photographed with the Statue of Liberty. It's an attitude which probably lessens the further away from the famous rock you are based in Ireland. But sailing folk familiar with the coast of West Cork will be well aware that the legendary oceanic submerged mountain is actually less than five miles from the pub on Cape Clear, so where's the big deal? You could easily go round it most days if you wished, so why bother to go round it at all? Even Rockabill off Fingal is further from Joe May's in Skerries than the Fastnet is from North Harbour. 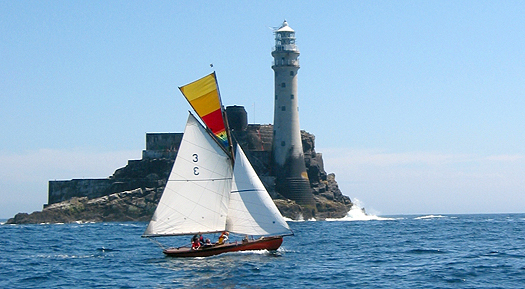 But for visitors, getting that Fastnet money shot is a straightforward, achievable and highly-desired objective. And however much the locals on the Irish coast take it for granted, back home in the big population heartlands of Europe or America or wherever, it's quite a trophy for that neighbourhood sailor recently back from Ireland's rugged seas to have on display. The magic Fastnet photo is also a popular ambition in that it gives a simple objective to any cruise. As Conor O'Brien observed when he took his old boat Kelpie to go off gun-running with Erskine and Molly Childers on their Asgard in 1914, it's good to have a straightforward objective when you go cruising. But possibly a second significant objective for our cruising visitors is to sail round Ireland, even if many of them find the West Coast so awesome once they get there that they linger on it, and return southward retracing their steps, rather than getting home via the "tame" east coast. Whatever, I'd reckon that these days Irish boats cruising round Ireland are out-numbered by visitors. For visitors, it's a neat objective, and it has all the attraction of going foreign, whereas a crew on a boat from one of Ireland's main sailing centres will have sailed an almost equally arduous voyage to our Atlantic coasts only to find that, thanks to our excellent new road system, they walk into the pub somewhere like Inishbofin, and find the place is filled with people from their home town who came up to Bofin only that morning. But whether they're from Ireland or abroad, visitors to Inishbofin and other desirable cruising destinations bring a bit of life to the place, and they spend money too. In these straitened times, it makes sense to find out what they expect in the way of facilities to persuade them to stay on and enjoy themselves, maybe tempting them to visit again. Even better, they might encourage others to do so as well, for it's an irony of this supposed age of impersonal electronic communication that word of mouth seems to work better than ever as a marketing tool. So what will make them happy and keen to come? About a year ago, Failte Ireland commissioned "A Review of Tourism Policy Regarding the Development and Funding of Marina and Berthing Facilities in Ireland". The company given the contract – an English consultancy based in the heart of the Solent area with its massive maritime recreational infrastructure – sensibly recruited a comprehensive expert advisory panel from among people in Ireland in the frontline of providing services to those cruising our coasts. Unlike Henry Ford, they'd at least made a gesture to finding out what people wanted. The result is a 68-page document which was effectively completed in December 2012, but is still embargoed. It awaits publication. The mills of Government truly grind slow, and never more so than at a time when, in any case, there's not a red cent available for expenditure on worthwhile maritime recreation infrastructural projects. So let us pass the time before its eventual publication with a bit of blue sky thinking about the Irish sailing cruising product, and marketing it. Let's think big, and put broad brush strokes into place. And let's start from basics. 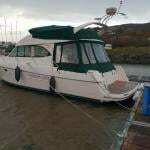 Why do we want to encourage more cruising boats to come to Ireland? Because they will bring much-needed tourism income, while the presence of cruising yachts sailing along a beautiful coastline enhances the impression it makes as an area of peace and prosperity, with the abundant presence of those boats in popular harbours further reinforcing these positive perceptions, thereby helping to reinforce the entire tourism experience for those ashore and afloat. 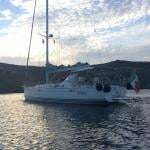 What is the experience that people who come here for sailing cruising holidays expect? Spectacular coastal scenery, good sailing conditions on clean water with decent breezes without being too rough, enough challenge in each day's sailing to give a sense of achievement when a hospitable and entertaining port is reached by evening, and in that port a convenient, welcoming and secure berth for the night among other friendly sailors. A proper cruising yacht will be fully equipped with her own anchoring system, but if Visitors' Moorings are available they will be used, as the very presence of established moorings will provide the risk of fouling if you drop your own anchor. If a marina or at least a pontoon is available, most visitors will prefer to berth there, as a pontoon berth with shoreside access allows greater freedom of movement for individual crewmembers, who after all have been cramped up together on a confined boat all day. Dyed-in-the-wool cruising enthusiasts and total boat-lovers may prefer the solitary splendour of lying to a mooring or an anchor. But most folk who are not totally addicted to traditional-style cruising will prefer the individual freedom and convenience provided by a marina berth. How can we provide the infrastructure to make cruising Ireland for visitors more enjoyable? There are at least a thousand over-lapping answers to that, but at its most basic the long-established official policy of hoping to have a coastal necklace of marinas every 35 miles still holds good. Obviously that is only the most basic plan – it would need to be varied frequently to fit in with local coastal conditions, population centres, and established harbours – but it provides a structure. Where do we expect most of our visitors to come from? While there is a small but significant "Transatlantic trade", most visitors will come from ports in an arc from the northeast to the southeast of Ireland. This includes Scotland, the Isle of Man, Northwest England, Wales, Southwest England, and countries beyond Land's End such as France, Belgium, The Netherlands, and of course the many large sailing centres on the south coast of England. The fact of having to round Land's End to get to Ireland for this latter group makes for two distinct visitor streams sailing to this country. The configuration of Ireland's south coast means that any boat rounding Land's End is virtually equidistant from all ports between West Cork and Wexford. With the prevailing winds from the southwest, and the most popular cruising grounds to be found in southwest Ireland, this southern stream will try to make westing as much as possible, preferably to West Cork and certainly no further east than Cork Harbour. They will only shape their course in a more easterly direction if they intend to go northwards through the Irish Sea. The Bristol Channel makes for the great divide, as most boats in the area are berthed along its north shore, on the south coast of Wales and in Milford Haven. Thus they are part of the other visitor stream. If heading for Ireland, they'll almost invariably make their landfall in south Wexford, and so they will share the needs of people from all ports in the Irish Sea for a better selection of facilities in southeast Ireland, which is the greatest single problem facing the overall development of Ireland's cruising product. Why is the lack of a good selection of harbours in southeast Ireland such a problem? The big-hearted little port. Despite its small size, Kilmore Quay manages to provide proper berthing for cruisers and a very active fishing fleet. By contrast, Dunmore East at the entrance to Waterford Estuary has marvellous natural advantages. Even if the weather is too extreme for offshore passages, there's plenty of sheltered cruising to be had up to Waterford and New Ross, with marinas at both places, while other anchorages are available in attractive surroundings. Crowded boats in Dunmore East, which has discouraged cruisers in times past. Yet despite the friendly Waterford Harbour Sailing Club there doing the best it can in difficult circumstances, the fisheries harbour at Dunmore East has long been noted as actively hostile to cruising boats. It has been a coastal hospitality blackspot on the entire area. The word is that some minor gestures of improvement may be on the way, but as it is, it's difficult to see why it has deteriorated so much, and why positive steps haven't been taken much sooner. Perhaps it's something to do with the fact that Waterford County Council is headquartered at Dungarvan in the west of the county, while just up the road in the northeast is the all-powerful and historic Waterford City Corporation. Whatever it is, Dunmore East harbour seems to be an administrative orphan. Yet it could be redeemed by being re-invigorated as a fishing port with a significant sailing presence. You only have to look at Dingle or Howth to realise that such a thing is perfectly possible. But if the powers that be from the southeast don't want to be seen going to other Irish harbours to see how Dunmore East might be re-born, then let them go to Mallaig on the west coast of Scotland. It used to be a byword for bad tempers, as fishing boats, ferries and cruising yachts battled for space. But now all is sweetness and light with the layout rationalized, and the cruising boats provided with their own neat little 50-berth marina which has made the place not merely somewhere you call by to implement crew changes using the famous west Highland Railway, but an attractive destination in its own right. So we'll be very interested to see what "A Review of Tourism Policy Regarding the Development and Funding of Marina and Berthing Facilities in Ireland" has to say about Dunmore East. There are times you'd be thinking it's the magic key to the whole thing. Intriguing to see that the Royal Yachting Association's new National Handicap System for cruisers is being launched at Ballyholme YC on Belfast Lough. Is it really so new? After all, most clubs have been getting by with the up-graded Portsmouth Yardstick system for a very long time. And as well, just across the North Channel, the Clyde Yacht Clubs Handicap has been catering for different cruisers for years, and most Belfast Lough boats have been able to avail of that. But then, things have always been a bit different on Belfast Lough. Back in the late 19th Century, it was a hotbed of pure One Design development, so maybe that tradition has something to do with the lack of a viable local cruiser handicapping system. And by heavens, when they said One Design For Level Racing, they meant it. Having been reared with Belfast Lough sailing, when I first sailed with an alleged One Design class in Dublin, I was amazed to find they ran two sets of results – scratch and handicap. Within the overall class programme, the competition for the handicap prizes was in its way every bit as intense as the straight one design racing. Thus most boats got a look-in at the prize giving, but in Belfast Lough some never figured at all. Their mood was set by unflinching Calvinists. So in the rare event that one of their One Design fleets ever got above a dozen boats, they'd no hesitation in making the next one Number 13. They wouldn't have dreamt of that in Dublin, where Number 13 simply didn't exist. But I had my very first race aboard the Belfast Lough Waverley Class 18ft Montrose, jointly owned by my father and uncle. And Montrose was Number 13. There are those who would suggest this has affected my life ever since, but they're wrong – touch wood. Be that as it may, regarding the RYA's claim to novelty for its NHS (I'm sure that won't be the final acronym, with the problems the National Health Service is having across the water these days), at least Mike Urwin of the RORC Measurement Office has made the point that in Ireland we've had a very successful "sundry boats" handicap system running for many years in parallel with the IRC (and the Channel Handicap and the IOR before that), our good and trusty old friend the ECHO system. It goes right back to 1971, when the late Bill Lacy began to develop a poor man's IOR at Howth by rating local boats on their performance against Otto Glaser's 42ft George McGruer-designed Admirals Cupper Tritsch-Tratsch I. Tritsch Tratsch, a remarkable varnished sloop, was very under-canvassed by today's standards, but a wizard to windward as she had a unique hull based on 12 Metre thinking. Despite her small rig, she could out-sail everything in the area (and elsewhere as well), so she was an excellent benchmark from which the system developed, with Billy working along with Chick Brown, another Howth sailor of mathematical inclinations. Across in Dun Laoghaire, Hal Sisk and Ernest Goulding had been working on something similar, and an area handicap system developed so successfully that it was given the grand title of East Coast Handicap Organisation, though those involved readily admitted that if anything, ECHO stood for Ernest, Chick, Hal and Others. Whatever, it worked, rating crews and helms as much as boats. It was a system which was readily accepted in an area where One Design Classes readily allocated different performance figures, and in a country where the Golfing Union of Ireland had led the world in handicapping individual players. As for those of us who felt our modest successes had been allowed to raise our handicaps too much, we could always take our boats and get them weighed and measured for a rating from the more impersonal Channel Handicap System. So now, 42 years after Bill Lacy and his friends started their ground-breaking system, they're hearing about something similar up north. One trusts that they're aware that not only is today the 13th of the month, but we're also in the year of superstition 2013. As for Tritsch-Tratsch the Great Echo Mother, the last I heard of her she was in Maine, with an owner who cherishes slightly eccentric classic boats. She is that and more. But what a performer to windward.....back in 1972 she was slugging upwind on a very windy but sunny Sunday morning out in the middle of the Irish Sea, rocketing along and making mincemeat of the steep breaking seas in an ISORA race, with the rest of the fleet way behind. "We can see that," said the ship. "But it's just that your boat is going great. Absolutely marvellous. D'you mind if we watch for a while?"